People are waiting for OPPO F11 and it is already in leaks around the web, Today on Twitter A Smartphone by Oppo just leaked with highlighting a Pop-up Selfie Camera and few other specifications. The smartphone is not yet known, but the guess are made for Oppo R19 or OPPO F11. On Feb 20 Vivo is about to launch a smartphone with Pop-up Selfie camera, the phone could be Vivo V15 Pro, So both companies could be competing with these smartphones. We have seen Pop-Selfie camera in Vivo NEX smartphone which was launched in July 2018. 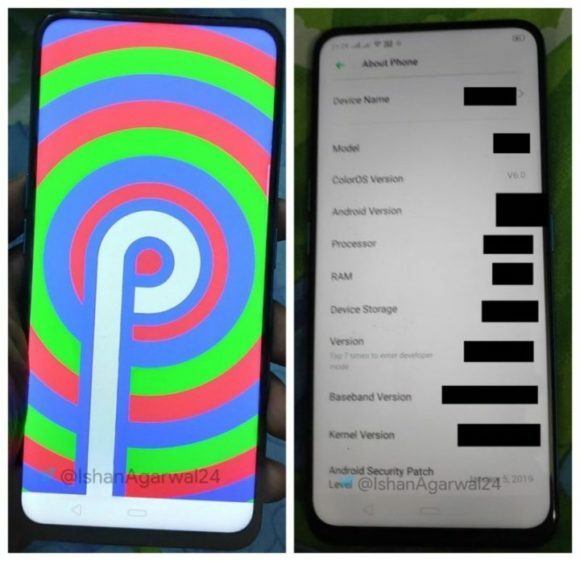 According to Leak this oppo device will be running on Android 9 Pie with latest ColorOS V6.0 skin which is specially designed for bezel-less Smartphones. It also shows that it has Jan 5 2019 Android Security Patch Level. Information other then this is hidden in the leaked images, We think the device would be Oppo R19, because the F11 is rumored to feature an in-display fingerprint scanner, but in this device there is a fingerprint scanner on the back side. Which device it would be? Oppo R19 or Oppo F11?? Comment below your thoughts and stay tuned with Alloftop for updates.